Oh, about the plate... Yes had to relocate the plate because of the bags. The bags come with a new bracket, so the plate is now located behind the left saddlebag.. It sill looks pretty cool tho. These are the saddlebags through HD. They're not bad. They look nice (leather exterior) but have the hard plastic frame inside. That being said, they do not provide much space for cross country. What I ended up doing was packing my clothes in spacesaver bags. The kind you can squeeze the air out of (made it easier at the hotels). I ended up getting a separate bag that I strapped down behind me. There I kept the map, raingear etc. I bought a muscle and was looking to do some cross country stuff with it. I noticed your saddle bags, where did you get them? I am interested in them because it doesn't seem like you had to move the license plate. Did you have to use mounting hardware? How do you like them? It does. I ended up taking the bike solo to Michigan last summer, with no problems what-so-ever. On my first year anniversary, I had over 7,200 miles on it. I got the windshield from HD. The only one they had for the muscle. Hi there, Sweet ride. I have a Black Muscle and want to put a screen on it. Does the one on your bike give you enough protection for your head? If so, what's your screen called? 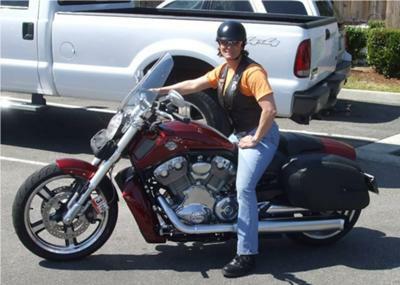 I really love the V-Rod, but being 5'1", I can't reach the forward controls. Recently I met a short lady riding one and she showed me how she had custom pegs, lower shocks and different bars so she could ride it. She loves it! I can only dream! Congrats on yours! My Boyfriend Will Be Jealous! Very nice bike. Congrats. My boyfriend has the 2003 anniversary edition of the V-Rod. He loves it, but recently saw the new one, your bike, at a dealer and fell in deeper love! I know there is a new muscle v-rod in his near future, lol. I went to a "Garage Party" for ladies at Harley Davidson, and one of the bikes they talked about was your bike. They said it handles very well, and is an awesome bike, it looks it. It is different from your standard Harley's...Unigue. Have fun, it is beautiful I am partial to that color...My HD is similar. Oh, and I am impressed! 1,200 miles in a weekend! I just got my first bike in Feb, I was excited that I put on 500 miles altogether since around March. I did 45ish miles today and thought I was a studette! LOL. I'll get there, still learning.. Ride Safe have fun on your trip. Awesome bike! Good luck on your trip. Be safe, have fun and take plenty of pictures.